With an overflowing bathroom vanity and some beautiful morning light, I decided to capture a few things I've really been loving recently. New discoveries as well as old favorites, this is a little story of my current repertoire. I've been taking full advantage of the abundance of shopping (finally) available to me now that we've moved to LA and I've been popping around Melrose and Abbot Kinney discovering so many fun brands and shops. It's felt a bit like being a kid in a candy store! My favorite discovery as of late has been the brand, Lola James Harper. Not only are the scents dreamy but so are the nostalgic stories behind them... read them [ here ]. I first spotted the brand when we were here looking for houses at a really cute store called LCD on Abbot Kinney. Forewarning if you get the chance to go - the place is a well-curated slippery slope. I have been loving the LJH fragrance "White Coffee on Teta Balcony" and well as "Little by Little with Joy". The first one I mentioned is actually a room spray but I've been using it as a perfume (living life on the edge). The candle collab they did with Love Adorned in Santa Monica is also so incredible that I'm hesitant to start burning it! Always the MOST apprehensive to try a new skin product, I was pleasantly surprised by how agreeable Lixir's Universal Emulsion is with my skin. I was admittedly sucked in by their beautiful packaging but their brand ethos of "less is more" really appealed to me as well. I'm a strong believer that the less you mess with your skin, the better it will be... so simple and straightforward products like this one are what I love most. A friend of mine recently gifted me this gorgeous bottle of Orange Blossom Water by Santa Maria Novella. The company dates back to the 1600s (which is nuts) and that is really apparent by how complex their fragrances are. I've always lusted after their Eau de Cologne but have never been able to be decisive and commit to picking one - they are all SO lovely. This orange blossom water is just heaven - light, airy, and SO fresh. 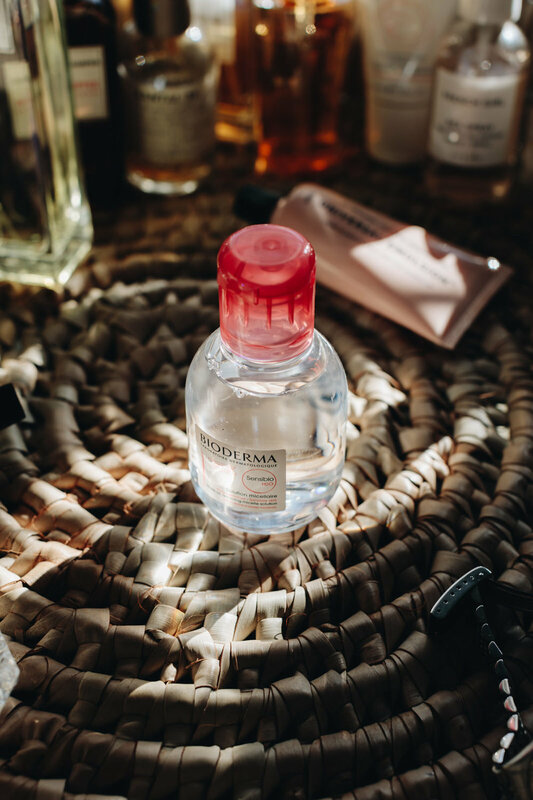 No beauty story would be complete without being honest about how much I use my LeLabo Tubereuse 40. The same incredibly chic friend that gifted me the Santa Maria Novella introduced me to Santal 33 a few years back and since then I've been a huge fan of almost anything LeLabo makes. Tubereuse 40 is one of their most special fragrances and it's pretty expensive (and only available in New York stores), but it's really so lovely and in my opinion, worth every penny. The last two products are ones that I use on a daily basis and travel everywhere with. They are true necessities for me! My roommate in New York City almost a decade ago was a runway model and always brought home the absolute best tips for makeup and skincare. Bioderma was one of her favorites because it saved her skin between the millions of times she had to have her makeup done and redone in one day. It doesn't require rinsing (although I always rinse my face with super cold water), and it takes off even the most stubborn waterproof mascara. My only note here would be that while the liquid is incredibly gentle, for some reason the wipes in this line actually irritate my skin. Avène has really been a lifesaver for me. I struggled with terrible eczema as a kid and I still have patches pop up here and there... especially when I am stressed or traveling a lot. If Avène is gentle enough for me, it must be gentle enough for anyone because almost all products that are non-prescription make my eczema ragingly worse. Not so with Avène and the bottle is even self sealing, which keeps the cream sterile. This is crucial if you suffer from skin issues. I really can't sing enough praise for this brand, I'm so happy I found it! I also love the XeraCalm AD Balm for my body (which I will link below)!